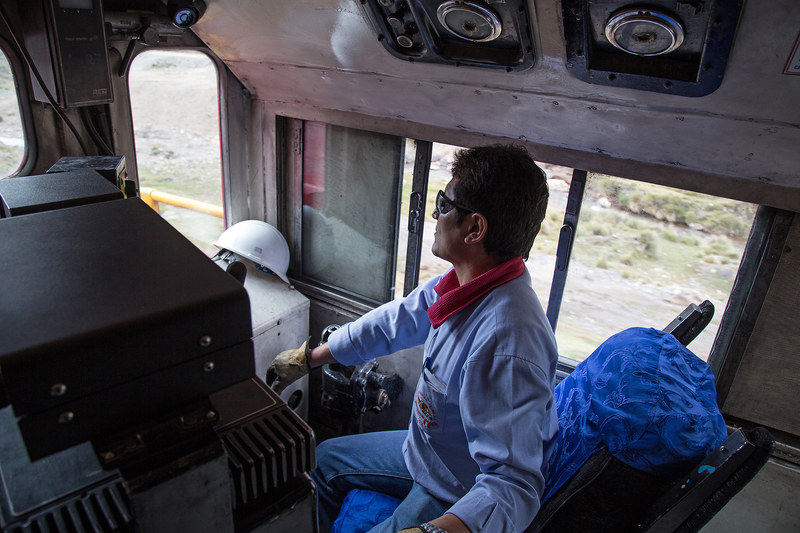 The following were taken with full permission of the Ferrocarril Central Andino. Thank you to the FCCA and its employees for their incredible hospitality! Special thanks to Francisco Carrion for making all the arrangements and being a amazing host! This entry takes place May 24th 2017, entries from the previous and following days will be posted at a later date. Video of this segment is below, there will be links throughout the page to go to specific points within the video. In the last segment we left off after ascending the 4.6 km Chicla switchback. 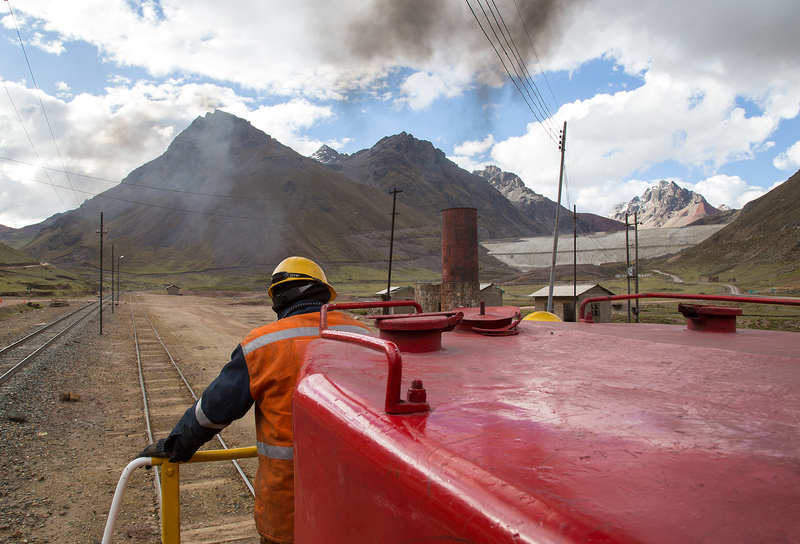 In part 4 we will travel into the heart of Peruvian mining country and to the highest point on the railroad, Galera summit at 15,681 ft above sea level. As we approach the town of Casapalca the high alpine vegetation fades away and is replaced by crumbling sandstone cliffs and a near absence of vegetation that will typify the remainder of the journey to the summit. 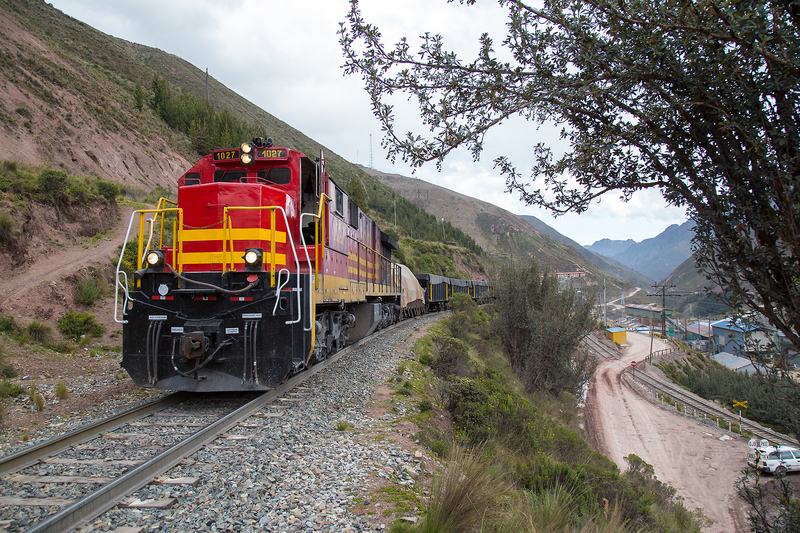 Casapalanca is the first true mining town on the railroad, here the natural canyon walls of the Rimac gorge are supplanted by a canyon of industry as the railroad squeezes through the middle of the Compana Minera Yauliyacu which ships lead and zinc concentrate out by rail. The vast number of people employed here is clearly evident by the large employee dormitories on the hillsides above the plant. After passing through the mill we reach the end of the track at a large concrete wall and then quickly proceed up the final switchback of the line which is located inside the industrial complex. We are at 13630 ft and the big GE is gasping for air as it shoots rich black clouds of smoke skywards. Leaving Casapalca we cross the Carr. Central one final time at grade, above us we can see both the railroad and the highway climbing high into the mountains where we will be in a few minutes. I generally make a few big mistakes every trip but thankfully this time this trip I was not alone and Doug’s reasoning saved us from making the first big mistake of the trip. 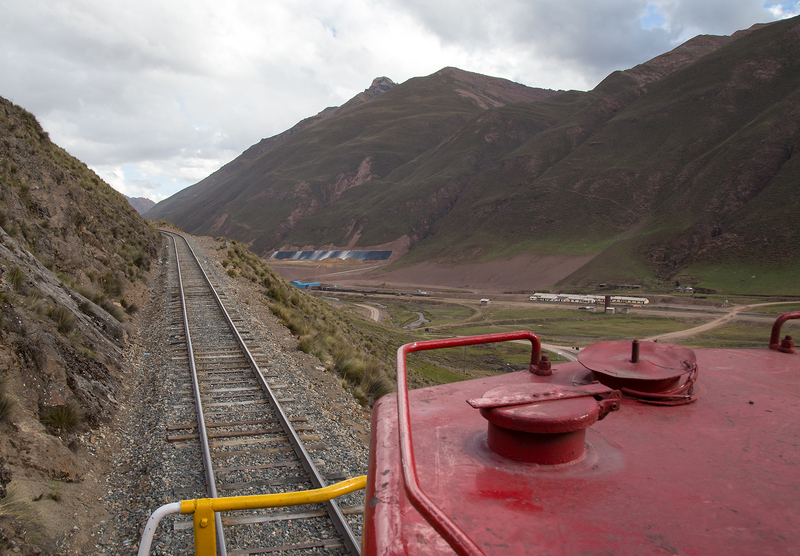 At Chincan siding we met a downhill train and stopped so that the crews could switch trains. Our crew seemed to think we should go with them back to Matucana and I was growing increasingly anxious on where we would meet our car since there are few roads to Galera and none that our sad little Toyota Yaris could navigate! Our cumulative lack of Spanish was not helping the situation but eventually we went with Doug’s call to continue as planned despite my fear of getting stranded 15,000 up in the mountains in the middle of nowhere. One way or the other we were now on our final leg to Galera. After sweeping around a large horseshoe curve the line climbs steeply up the other side of the valley clinging to the edge of a very steep cliff. 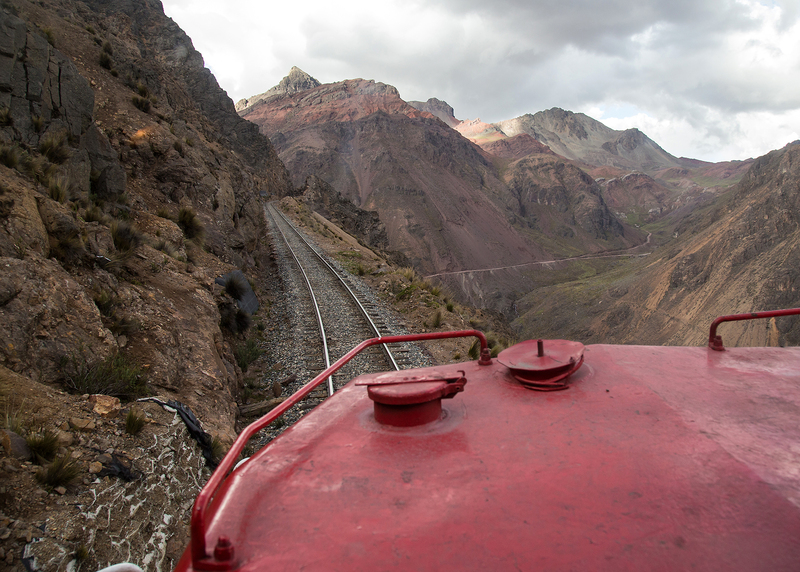 Its really hard to rate what is the most scenic part of this railroad as it is all stunning but the segment from Chincan to Galera might just win that honor. 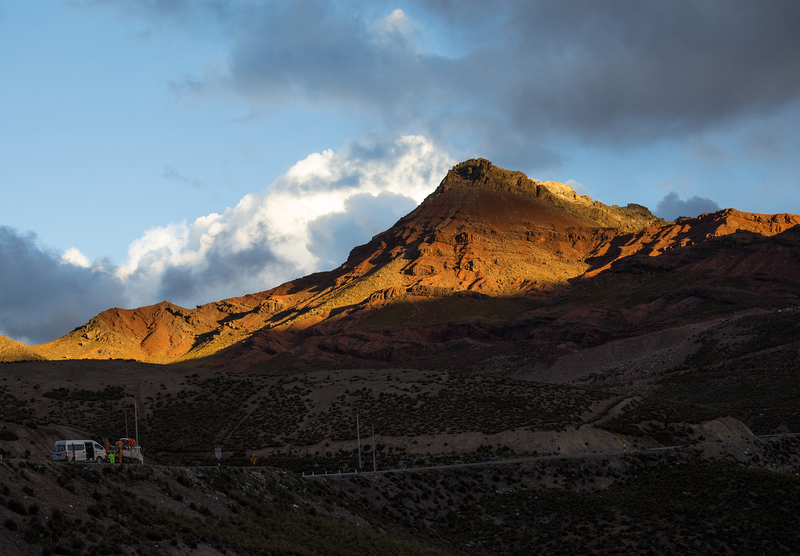 The line passes through 7 tunnels in just 3 kilometers between KM 166-KM 169 and in the distance tall snowcapped peaks signal that you have almost reached the summit. 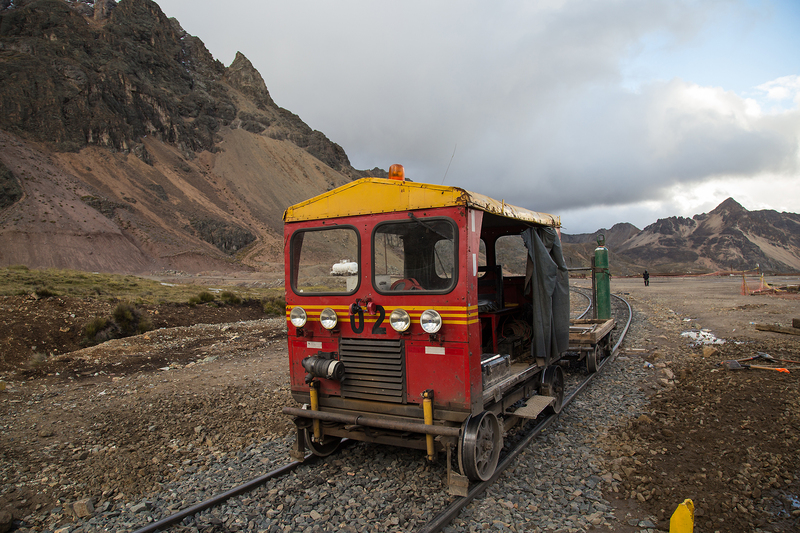 The temperature has also drastically changed, while we were perfectly comfortable riding on the front porch in T-shirts for most of the trip up here even our jackets were not enough and we retreated inside the cab. 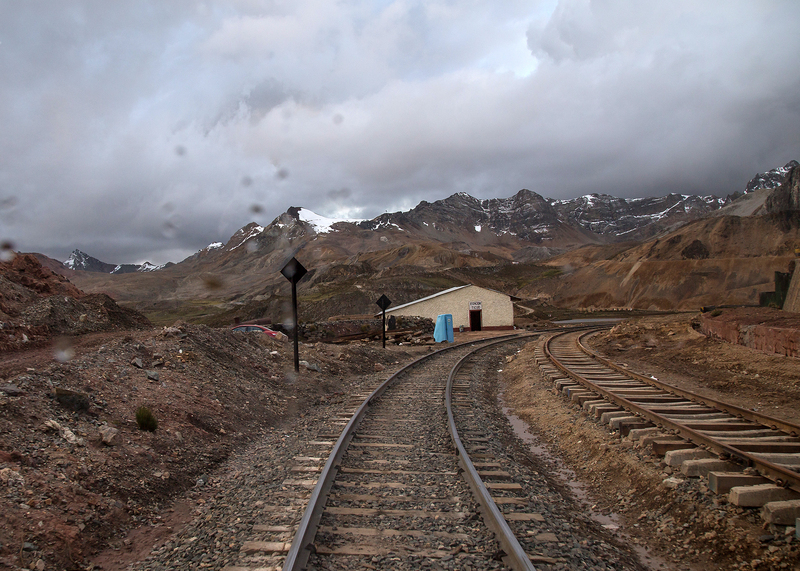 Departing Chinchan siding, some rusting remnants of the steam era are visible and in the distance the high snowcapped peak of Yuraqqucha mountain (16,700 ft) is visible. 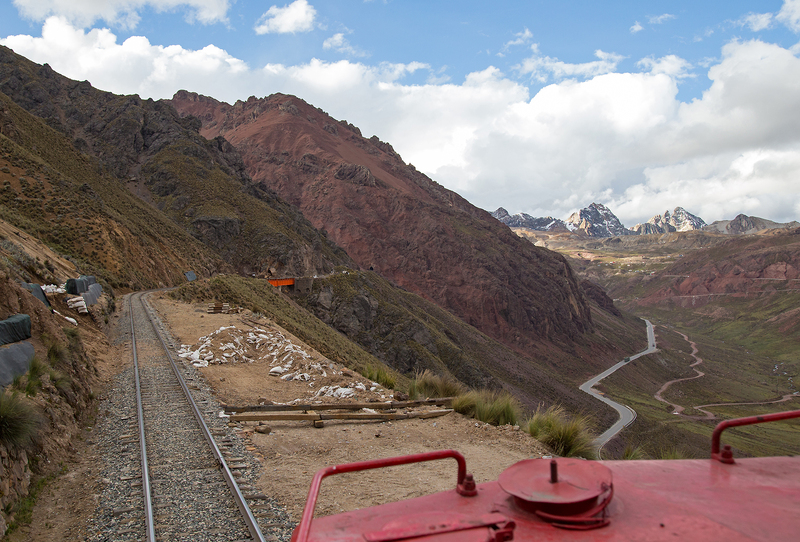 After leaving Chincan the track makes a big horseshoe around the valley to begin its ascent to Galera. In the distance is the dam of a massive mine tailings pond, the mountains in this area are rich in minerals and evidence of mining is all around. In just 2 kilometers we have climbed almost 250 feet and the train we met can be seen far below in the valley still stopped at the Chincan siding. Evidence of an old wye can still clearly be seen. 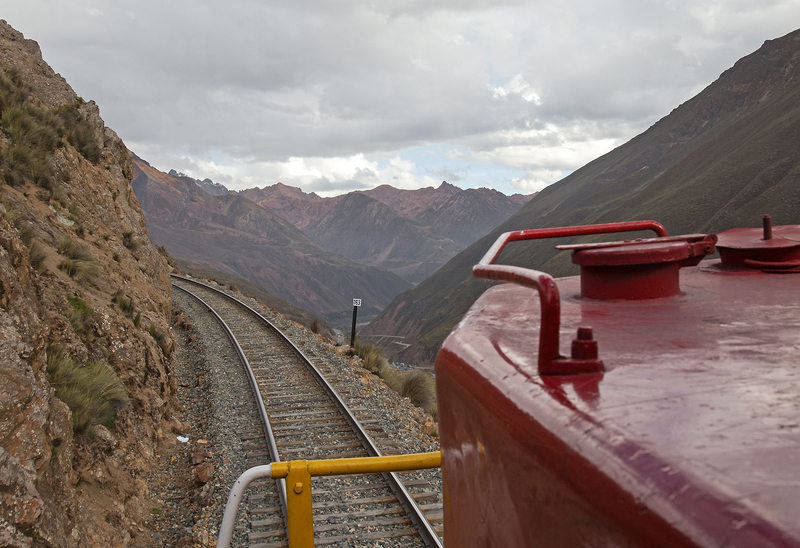 During the steam era Chinchan was likely a helper base for the stiff grade to Galera, even today trains often stall on this grade due to the steep grades and lack of oxygen. Looking down the valley towards Casapalca as we pass the KM 163, the Carr Central can be seen far below. 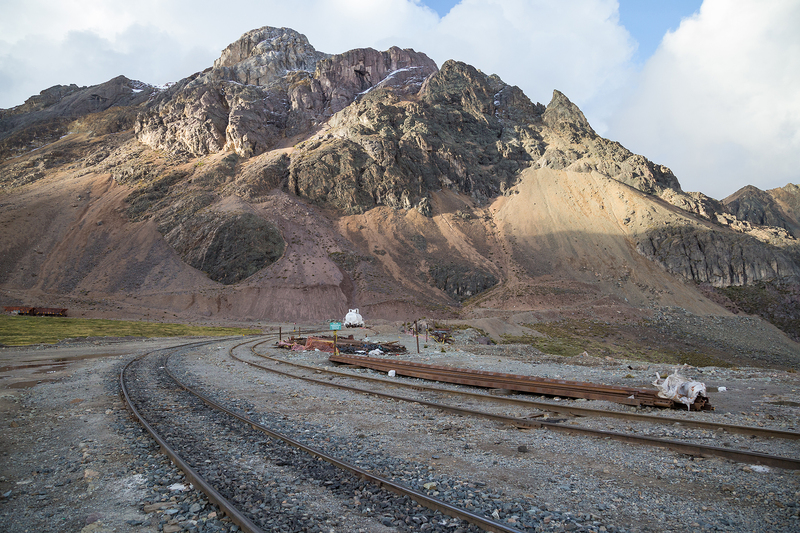 Truly railroading at the top of the world, in the distance the snowcapped Ticlio Peak which stands 16,900 ft tall can be seen. We pass through a very quick succession of short tunnels and no sooner have we exited tunnel 53 will we dive into 54. As we round a curve a spectacular view of the snowcapped peaks unfolds itself infront of us. The Carr. 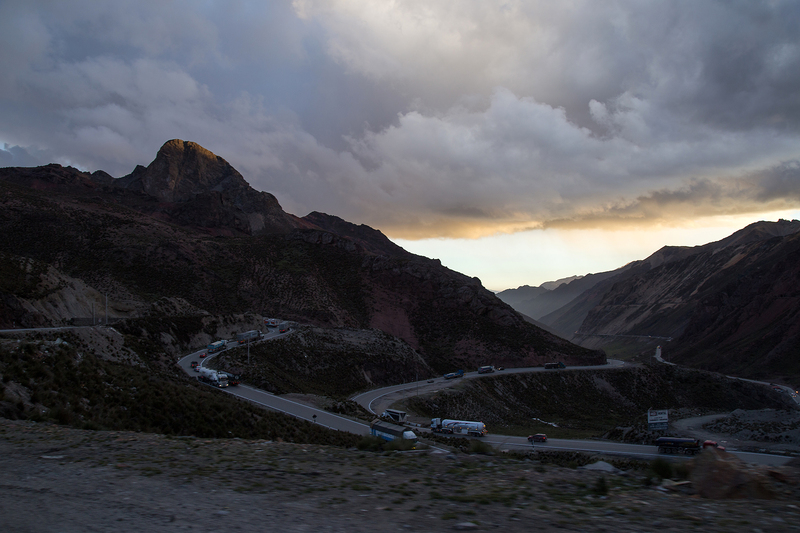 Central can be seen climbing the hill through a series of torturous switchbacks and a long line of trucks clog the road. Skirting Lake Ticlio on the final stretch to the summit, ahead we will duck under the Carr Central, pass the Chicla station and then plunge into the depths of the Galera tunnel. 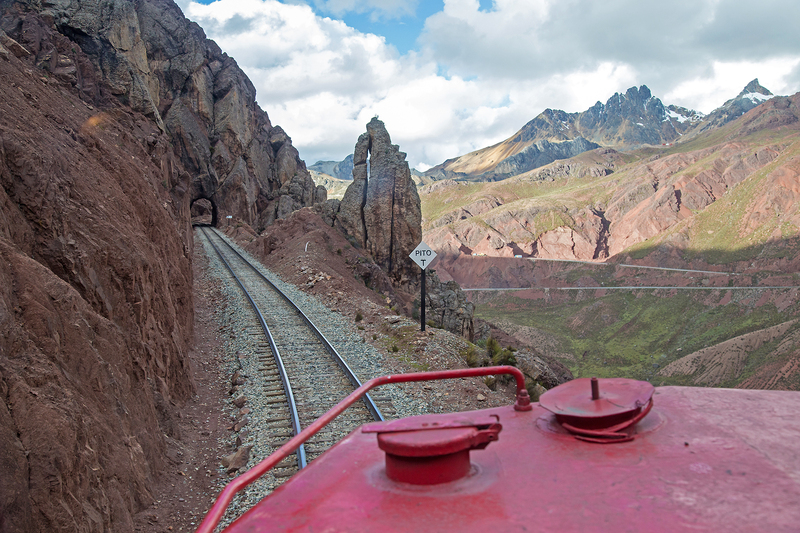 As we round the curve at Ticlio we spot to my relief and Doug’s confusion our sad little Toyota Yaris whose driver has thankfully made it here, I assume we will return back with another train but it was now Doug’s turn to worry as we charge upwards past Ticlio without stopping. The entrance to Galera is actually somewhat anticlimatic, those expecting an ornate tunnel portal with the tunnel name and date emblazoned in raised lettering like at Gotthard or Moffatt will be dissapointed to see a tunnel portal much like all the others. Only once inside do you realize you are in the nearly 3/4 mile summit tunnel. 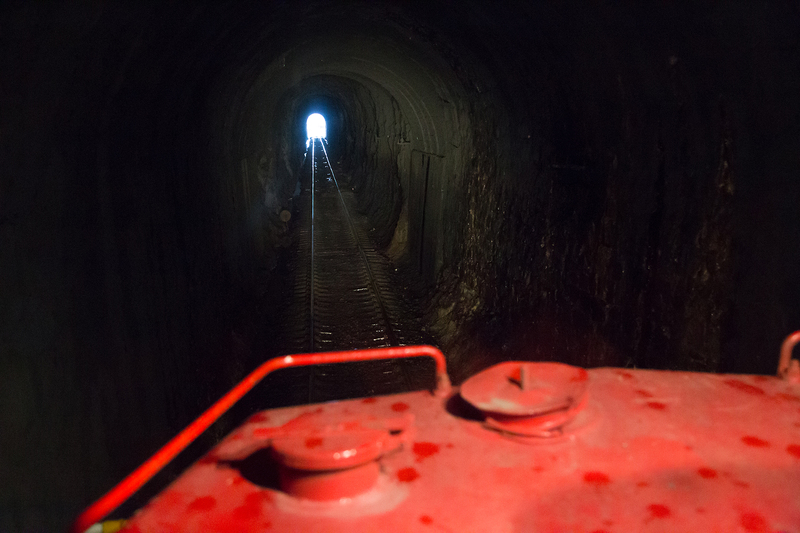 At first it is just blackness ahead lit only by the locomotive headlight, then we crest the actual summit of the line and the distant light appears as we coast downhill towards Galera. 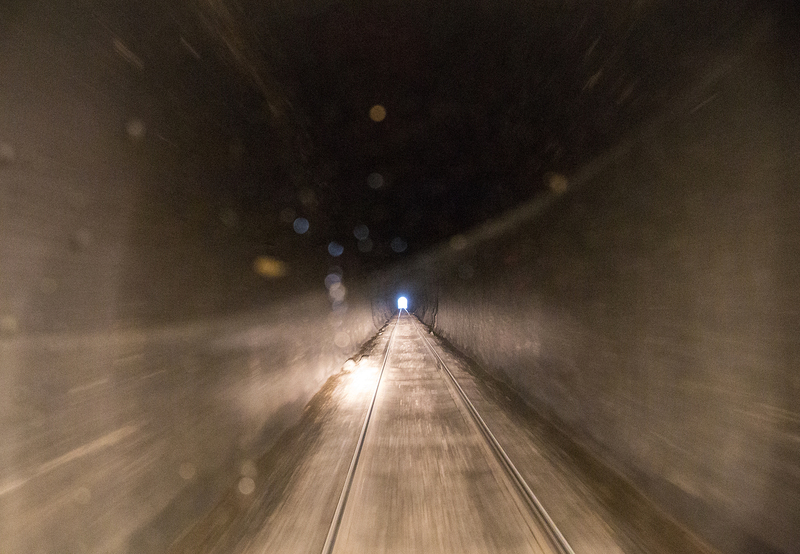 Inside the depths of Galera tunnel, the tunnel is nearly 3/4s of a mile long. 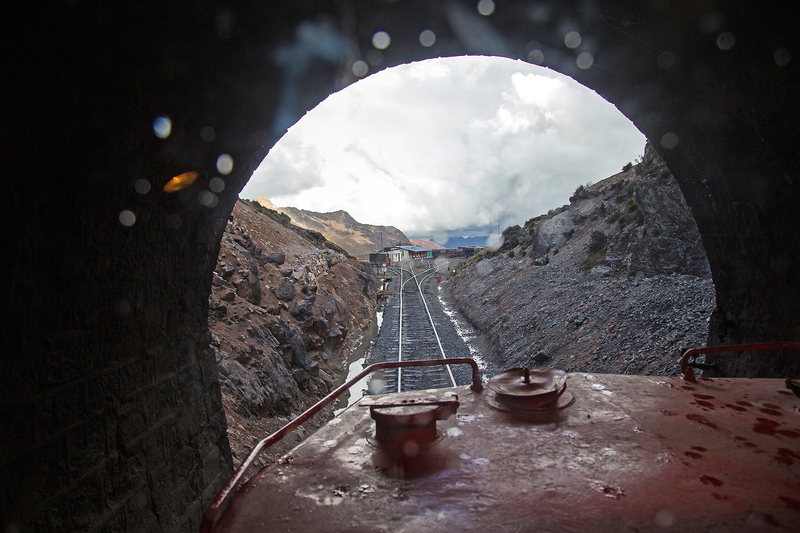 Emerging out of Galera tunnel with the windshield covered in water droplets from all the condensation and leaking water inside the tunnel. 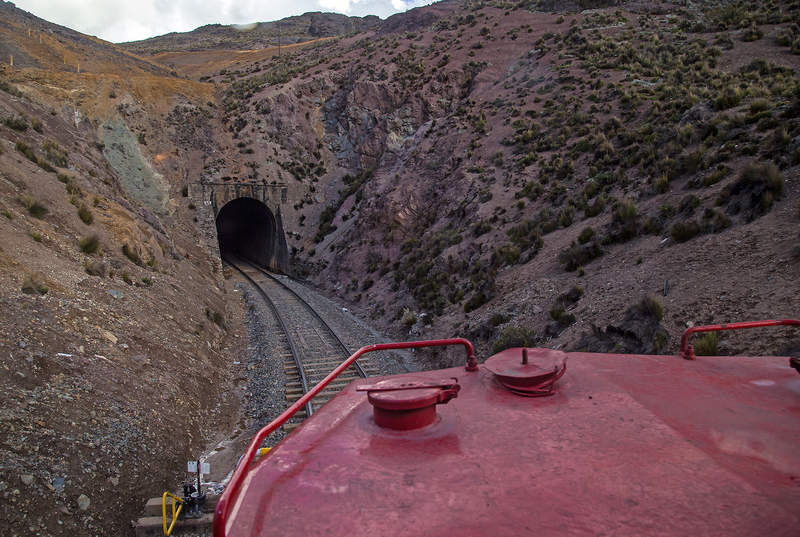 As we exit the tunnel we arrive at the small yard at Galera, here trains will stop to set out cars and the unmodified C39-8s which work this side of the pass will cut off as they do not fit through the tunnel. 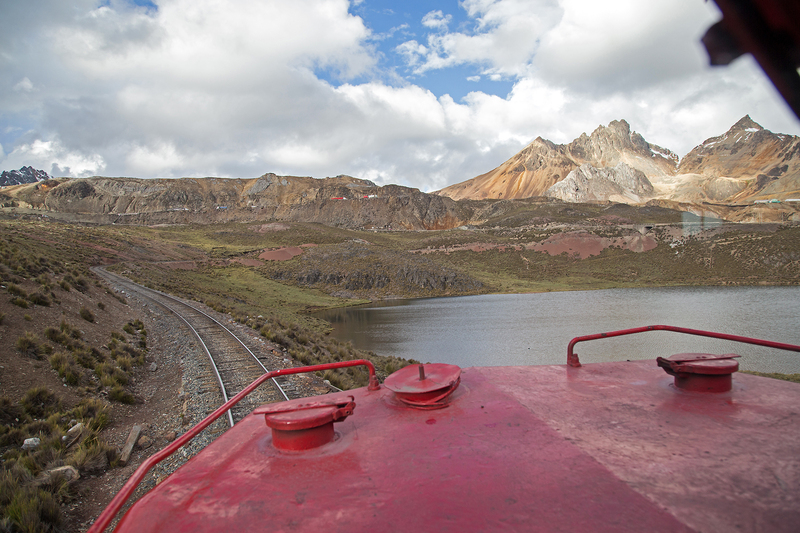 As we get down from the locomotive the altitude really hits us, every step is difficult. 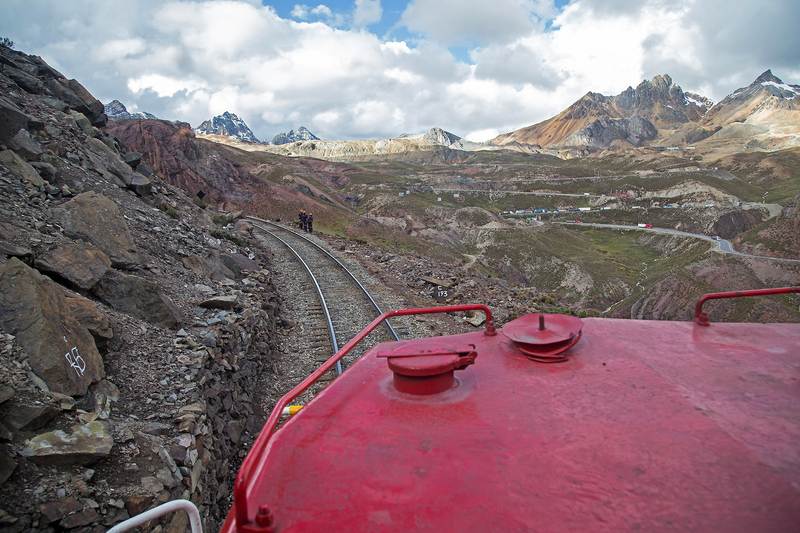 Just climbing down from the locomotive takes some serious effort, but thankfully neither of us are suffering from altitude sickness. 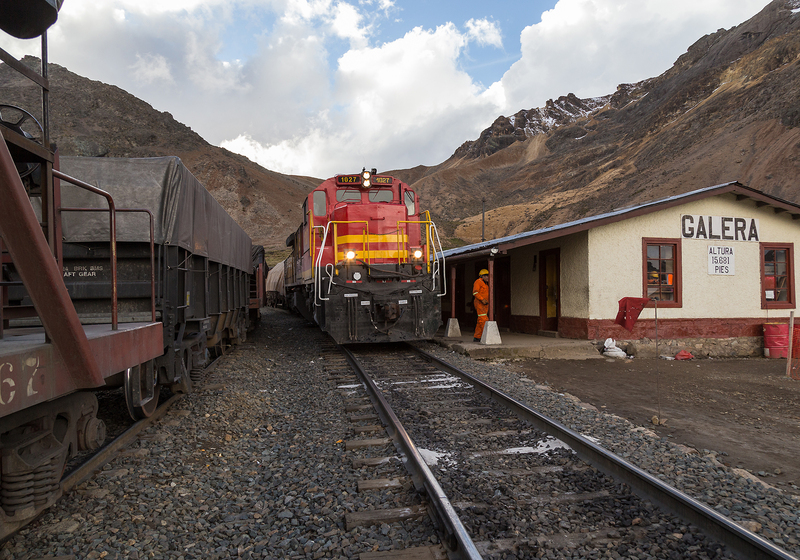 At this point we weren’t quite sure how we were getting back, I thought we would exchange our train of empties for the loads sitting in the yard and then return to Chicla after wying the locomotive. However our ride home would be even less glamorous than a C39-8 but just as unique of an experience. 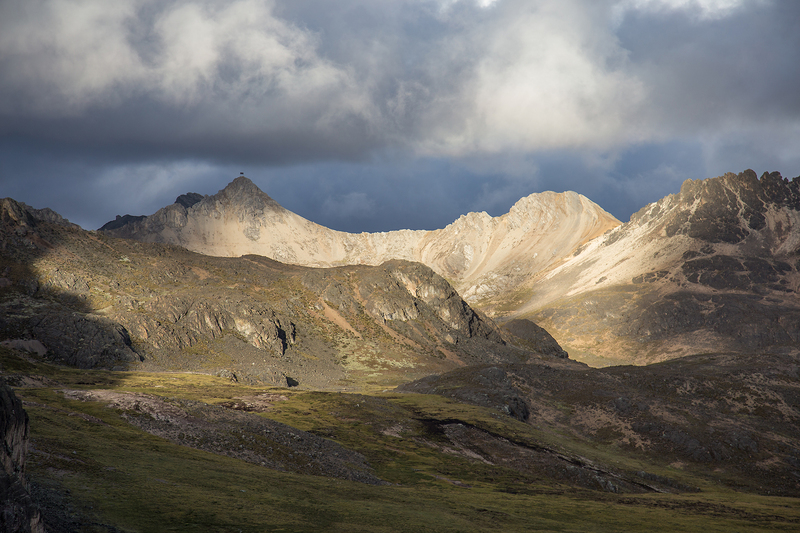 The late evening sun shines through the clouds and illuminates the stark landscape against the dark clouds of gathering winter storms. The Galera wye, a somewhat unique feature as most spots on the FCCA use turntables to save space in the difficult topography. 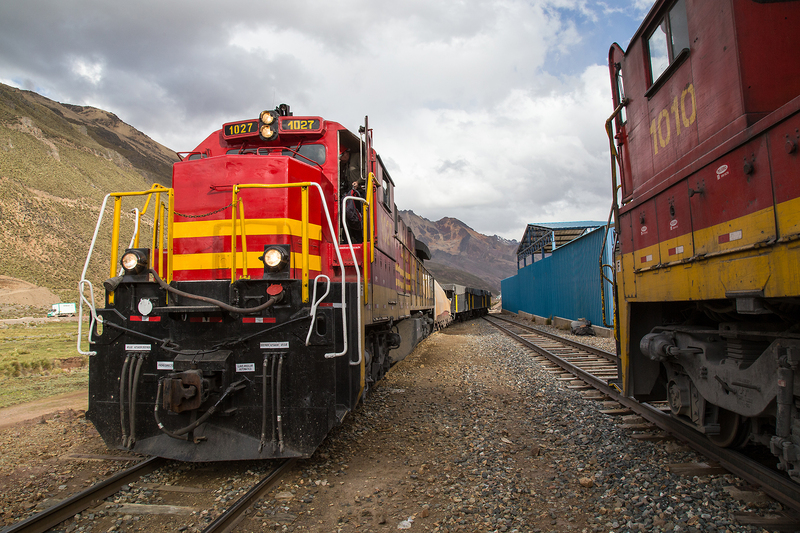 One has to wonder if the physical considerations of pushing a locomotive by hand at such altitudes factored into the decision. Our answer to how we would return to Chicla lay on the south leg of the wye where a motorcar had brought up a section gang which was busy driving spikes into freshly installed untreated wood ties. One can only imagine the strength it takes to perform such tasks at this altitude. 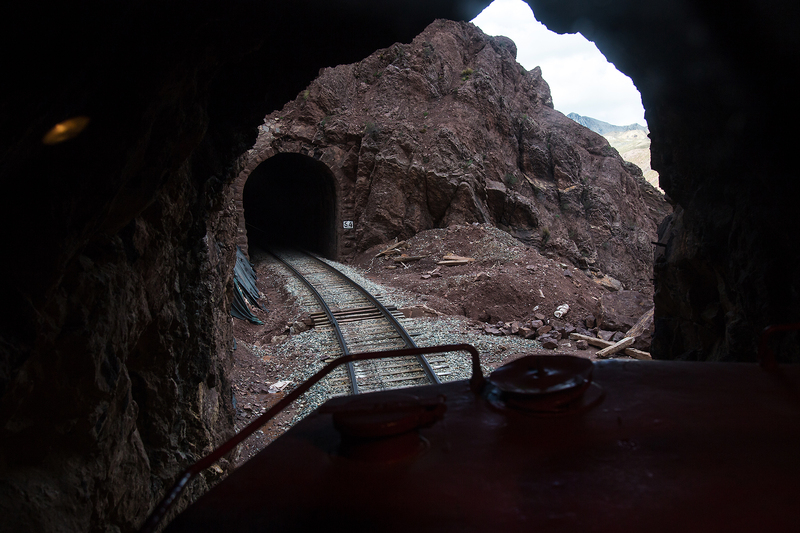 Soon we headed off in the somewhat cramped motorcar back into the tunnel, noticeably darker with only the small headlights illuminating the way. After arriving at Ticlio we were greeted by the driver the FCCA had sent to pick us up. 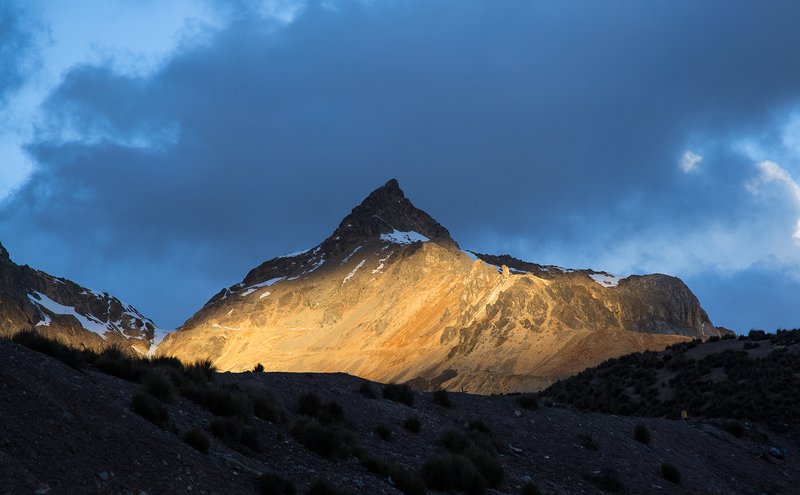 Thankfully our little car had made it up the dirt road to the station and after proceeding through the mining checkpoint we stopped for a few photos on the side of the Carr Central of the last rays of sun lighting up the distant peaks. After that it would be a long dark drive down the Central highway to San Mateo where we would spend the night. 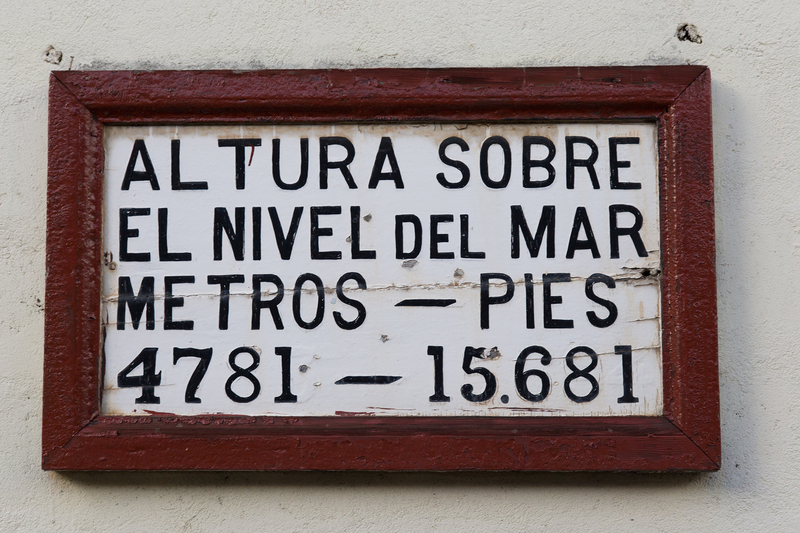 We stayed the night in the small mountain town of San Mateo which we passed in Part 2 there are only a few decent hotels in the mountains so I can recommend the Hospedaje Las Americanas. The rooms were clean and relatively large with better hot water than we had found in most places, the beds also had plenty of warm covers, very important as cold as it gets here at night. I will warn that I think I got bitten by bedbugs on the second night here but neither of the other 3 people had a problem so might be an isolated incident. 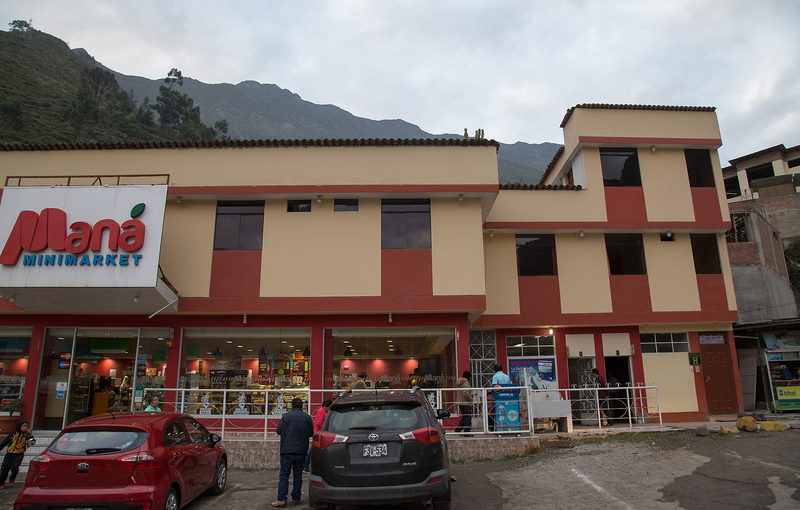 The hotel has two parts, on the east side of the highway is the main check in desk and the single occupant rooms, across the street there are two person rooms above the Mana mart. Across the street is the Chez Victor resteraunt which though a little expensive by Peruvian standards but quite good, try to Lomo Saltado with a Cusquena, a perfect treat after a day railfanning the FCCA! 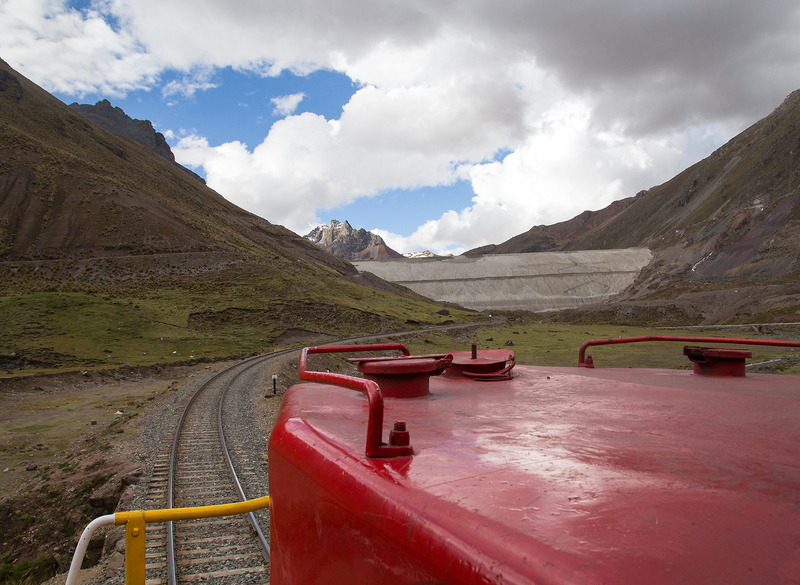 If you’ve made it this far thanks for checking out this series, more soon on Peru and the FCCA. If you ever get the chance I highly recommend travelling this line via FCCA several times a year tourist train which will give you a far more luxurious tour of the line than our C39-8. 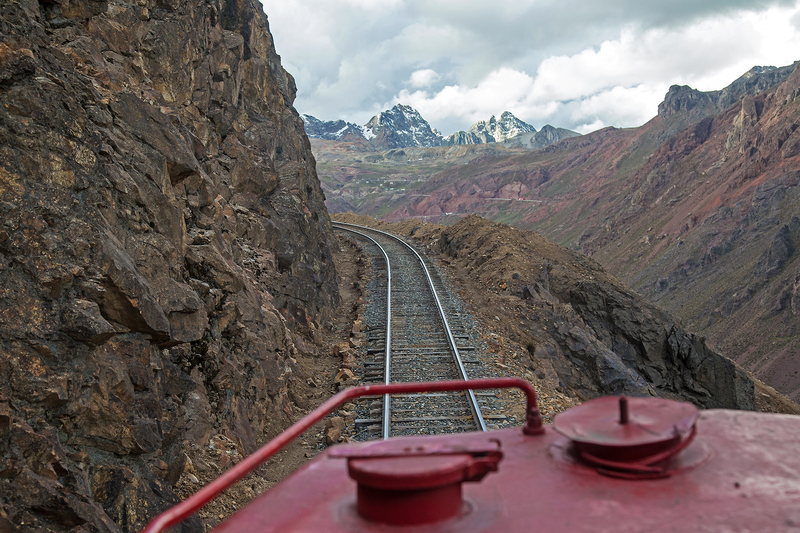 Every rail enthusiast should have this line on their bucket list, its truly an unforgettable journey! Tickets can be purchased here at the FCCA’s website.